Nissan wanted to leverage their current ‘Built for Thrill’ campaign and TV commercial for the Nissan Juke, which features sky-divers assembling the car whilst free-falling through the air. Nissan’s experiential agency TRO approached Inition to help them create an exciting experience for the centrepiece on Nissan’s stand at the Goodwood Festival of Speed. Inition came up with the idea of the ‘Built to Thrill Wingsuit VR Experience’ to immerse participants in a multi-sensory 3D world inspired by close-proximity wingsuit flying. The experience begins with a jump out an aeroplane at 21,000 feet. Participants are given a mission to collect as many Nissan Juke components as possible on the way down through a mountain and urban landscape. Participants steer themselves by applying pressure to to left and right ‘wing’ sections, powerful computer-controlled fans mimic the rush of air as they fly through the air and finally try to land on the Nissan Juke, collecting ‘Thrill Points’ en route. 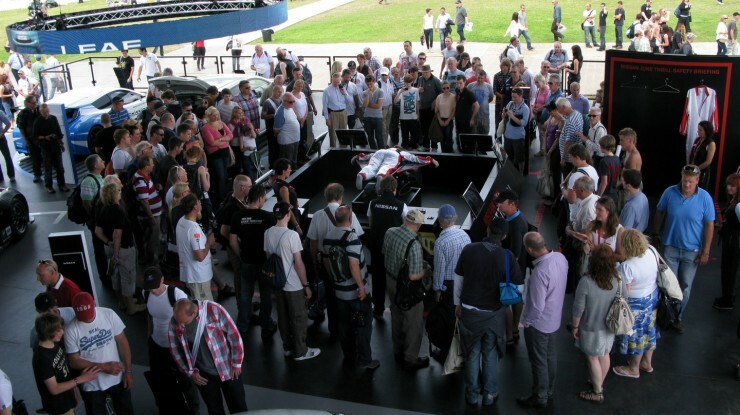 The opportunity to take part in a fully-immersive human flight experience attracted a constant stream of willing participants on Nissan’s stand and was also enjoyed by hundreds of onlookers. The game attracted 368 participants across the four days it was at the festival, with as many as 103 participants on the busiest day. Nissan took taking the Built to Thrill Wingsuit Experience to the Frankfurt and Paris motorshows and it also featured at the ATP Tennis Tournament at The O2.